Last year I had some work done under warranty and the garage upgraded the ECU for free while they were at it. This seemed to improve acceleration more than anything but I get about 60mpg on motorway journeys and 40mpg on 1 mile sub-30mph trips. This is an 08 1.8 tdci - I am more than happy with the economy. I do always use the premium diesel and I always used premium petrol on previous cars. My 1997 BMW 1.8 petrol averaged 40mpg running on high octane fuel, but maybe old petrols need it more... makes sense that better quality fuel will help in the long run. To rectify this, I bought a bluetooth receiver which plugs into the 3.5mm jack inside the central storage box. This one is battery powered, but rechargeable and lasts for many hours - cost under a tenner. There are quite a few on Amazon. Very easy way to add this nice functionality, but does seem daft not to allow media output on the high spec stereo! Ok, so took the car into the dealer today and they spent a long time on it, but could not find the fault. Today, the issue with 2nd gear was not so bad. Firstly that is annoying, but also it makes me wonder what can be an issue one day but not another. The power is certainly a bit lacking at first in 2nd, but kicks in within 2 seconds. On a bad day, the car almost stalls in 2nd. The dealer said they would carry on looking into it next week if I wanted... they didn't charge a penny despite taking it for 2 test drives. They don't think it's the DMF based on the fact that it drove fine today... Now I am none the wiser! You blanked your EGR valve in 5 minutes? I'll pay you to do mine (with the 1cm hole to prevent warning lights)! I suppose I want to avoid voiding the warranty as I have a 3 year warranty. Taking the car in on Friday to have it looked at. I am concerned (for no particular reason) that if they do not find a fault they will charge me even though I have the warranty. I will show them the issue if they can't find it! Well, the mystery was not solved as such, but as I had already started the process of looking for a C-Max, one came up and I have already traded in the Focus. In addition, we did have a heavy load of Christmas presents coming back on a 160 mile journey and had not driven the car much until the day it went funny. From looking at a few videos, it does seem like the swaying and rolling which never used to exist is to do with the shocks - I have had this on other cars in the past. It feels like there are a few things wrong now though! Do I pay for diagnostics, then pay for work or just trade it in and let them do all that in their own time and they can give me whatever price they see fit. To add to my paranoia, when I bought the car, it had just been traded in and they had not checked it - I test drove it and it felt ok - I had just arrived in our Nissan Micra which is supposed to be like a trampoline, so it was hard to tell if there was a problem with the Focus. 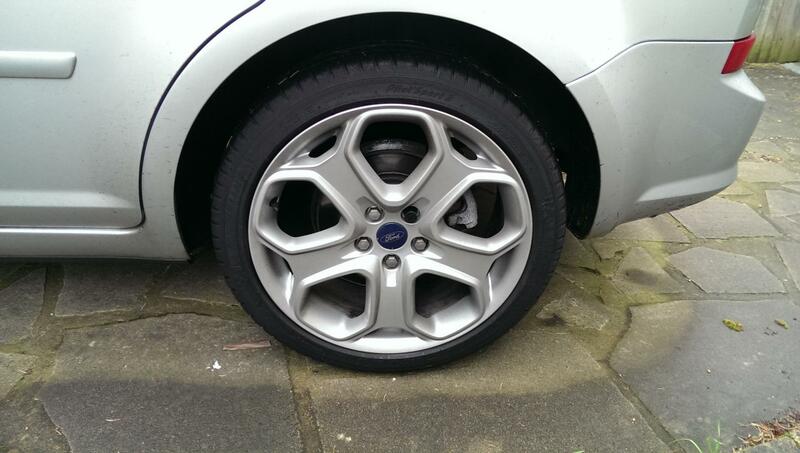 When the Ford garage prepared the car for me (they were very thorough), the said that the wheels were buckled and they had to replace the wheels and tyres (free of charge of course). The car felt perfect when I picked it up though. I am just paranoid that there has always been a weakness from the previous owner... I was literally looking at C-Max models the day before the suspension went funny! It is strange - I can tell you that. We bought nothing at the garden centre, so left with the same load as we arrived. Of course there are always minor bumps on roads, so I guess if a weakness had developed it could have been the final straw on a little bump... I checked the suspension on each corner - nothing obvious. The front seems to firmly spring back with no bounce. The rear kind of bounces twice in comparison, but both corners seem the same - not sure if that's normal? Rear seems less rigid than front, but I guess that is pretty normal for most hatchbacks? One thing that I have noticed which may help further diagnosis - when I park the car on the drive and pull the handbrake - when I take my foot off the brake pedal, the car moves quite a lot forward (drive is a slight slope). This never used to happen, so it must be related. Feel like something or a number of things are loose! At the moment I am only driving it locally and the feeling when driving on a fairly straight, flat road is that the car is wobbling or drifting subtly. It just feels like a completely different car to the solid, stiffer ride it had last week. It really makes you feel weird as you keep thinking "did the car just move weirdly while I was going in a straight line?". Quite freaky. How can a quick change transform a decent car into something horrible to drive? Sorry about the ranting!